We'd love to share more information about the darling puppies that we have available. 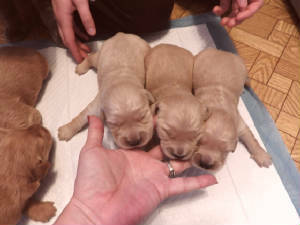 So when you send us your introduction, as written about on our "purchasing process" page, and let us know the SPECIFIC DATE that you want to get a puppy, then we will send you a complete listing of all of the available puppies that would meet your timing and criteria. The list will include pricing and video links. There is NO difference between a Mini Retriever and a Mini Golden Retriever. They are the same thing. People just use both names. !!! Do send us your introduction as asked for on our purchasing process page if you want to receive any additional information from us. 3. We will be going through our doing final evaluations on a couple of "hold back" puppies and so there will beteen now and May 15th. 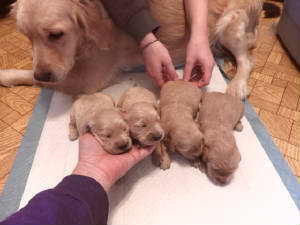 No new Mini Retriever puppies born in mid February, March or April, therefore no 8 week old puppies will be available to leave in mid April, May or June. Find us on Facebook at "Regal Kennel"